I had so much fun collaborating with Alexa last year that I was dying to find another project we could do together! As we got to know one another better, we realized just how much we had in common - including our goals for 2015. We both wanted to become a little pickier about what we read for review and what we added to our shelves. Before we explain how, we're going to talk about why we want to make these changes. Before I looked at the source breakdown, I was afraid that I'd spent the majority of my time reading books for review. So, I was happy when I realized that I'd done a better job of splitting my time between review books, TBR books and books I purchased in 2014 than I initially thought I did! But I can't give myself too much credit here because I wasn't monitoring my progress along the way. I'm going to make an effort in 2015 to decrease the number of books I read for review and increase the number of books I read from my TBR. While it seems like I put a bit of a dent in my TBR, I unfortunately undermined myself... As you'll see in a bit, I bought so many books that I practically canceled out any progress I'd made on my TBR! 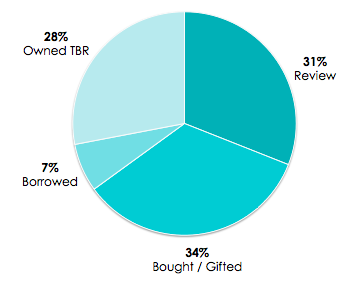 I'd love for it to be closer to 50% from my TBR in 2015. I'm not too surprised by these results! I'd noticed that I was gravitating towards physical books this year, and I've always preferred hardcovers when I can get my hands on them. The majority of my TBR is actually in print and not on my Kindle,, so I know that also plays into why I'm predominately reading hardcovers and paperbacks. However, I'm not too concerned about the format of what I read so I don't plan to make any changes. I'm actually pretty happy with this breakdown! 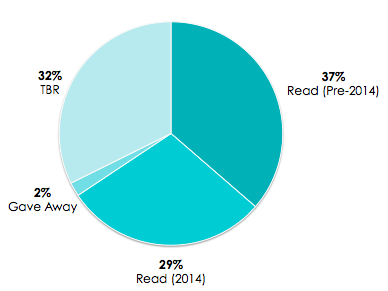 Young Adult made up the bulk of my reading in 2013, and I'd wanted to change that in 2014. Prior to blogging, I really only read Adult and Non-Fiction. And honestly, I didn't like how blogging had changed my reading choices so significantly. I love YA, but I could tell I was reading books just because everyone was talking about them - not because they necessarily appealed to me. 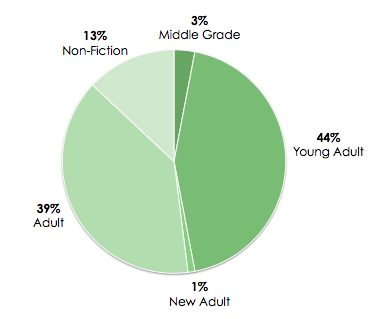 So, I'm pleased that Adult and Non-Fiction combined made up 52% of my reading in 2014. That's exactly what I was hoping to accomplish! I wanted more variety in what I chose to read... or, at the very least, a little more balance. I want to continue this trend in the year to come - maybe even increasing my Middle Grade reads a bit. Either way, I think this breakdown is a big reason why I loved more of what I read in 2014. I originally broke this down into more specific genres, but it made the graph way too messy. So, I stuck to somewhat broader genres. I thought Historical Fiction might be higher, but I'm not too shocked at this breakdown. I knew I'd read a lot of Contemporary in 2014! I've been steadily increasing the amount of Fantasy I read - it's quickly becoming one of my most-read genres. And, I'm obsessed with the combination of Historical and Fantasy: two of my favorites in one! Either way, I'm glad there's so much variety here. Holy cow! Now, THIS was shocking to me. I finished 15 series this year (eight that I read from start to finish), so I should have known this number would be pretty high. But still! I adore series, but I had no idea they made up half of my reading choices in 2014. I honestly don't have a problem with this statistic. As long as I'm actually finishing series, this addiction can continue. I'll be interested to see how this will look at the end of 2015. Well, it definitely seems like I chose a lot of good books in 2014. I did not expect to have so many five-star reads... I must be getting softer! And how am I giving out so many 3.5 ratings?! 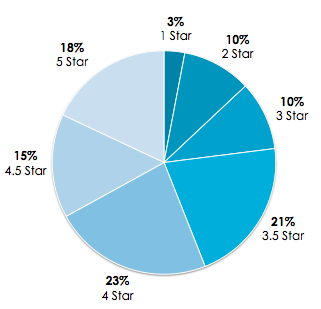 I definitely expected there to be more 3-star reads, but I must be defaulting to 3.5 instead. However, I'm not surprised one-star and two-star is my least common rating because I'm generally pretty good about setting a book down if I don't like it. There's not a lot of variety here, but I'm not shocked Review reads have my lowest average rating. This is one of the statistics I was most curious to see. I think I too often read things for review that might not interest me otherwise. Even worse, I'm more likely to finish a review book even when I'm not enjoying it. I have some things planned for 2015 that will hopefully help me get better about saying no to review books when they don't interest me and putting them down when it's just not working out. I read books from more publishers than the ones listed here, but I decided to highlight the ones that were my most read. There were too many where I just read one book! 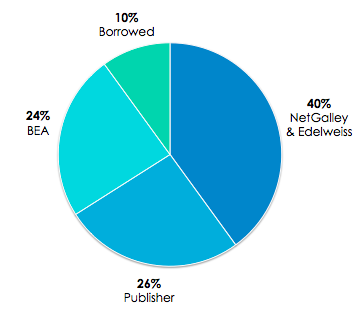 So, it seems that Bloomsbury and Simon & Schuster were the clear winners in 2014. Some of my favorite reads this year were from these two publishers, which means I need to pay better attention to their new releases in 2015. 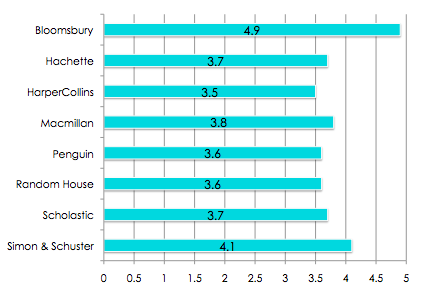 HarperCollins, Penguin and Random House had the lowest average rating, which wasn't totally surprising to me. I took a chance on some books from these publishers, and they didn't really pay off in the end. I'll keep that in mind this year when I'm deciding what I want to buy and accept for review! I received 96 review books in 2014, and here's what I did with those books! Since I'm still developing publishing contacts, I made an effort to read almost every book that I received for review. In fact, almost all of the books that I did not finish were books that I grabbed at BEA. A lot of those books were ones that I just randomly grabbed, so I probably shouldn't be surprised that a lot of them didn't work out. in 2015, I'm hoping to cut the number of review books I read in half. It would be a big shift for me, but I think it would be for the best! I'm glad I looked up this breakdown! You know why? It's clear to me that a little self-control will go a long way. I get most of my review books from NetGalley and Edelweiss, and I'm the one who has control over what I do and do not request there. Now, some of those books are ones I receive a widget for from the publisher, but still... And I don't think I'll be going to BEA this year, so that will also eliminate a lot of review books, too. I enjoy reading books in both formats - print and digital. 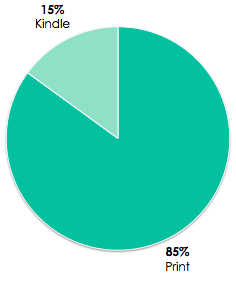 But I had no idea that I barely bought any Kindle books this year! I discovered Book Outlet this year, which has been terrible (and wonderful) for my shelves. I'd like to say that's the biggest reason I bought so many more print books, but I'm not totally sure that's true... Either way, my book buying was OUT OF CONTROL this year. I'm seriously embarrassed by what I'm about to admit below. Y'all, I've been dreading this section of my post. I don't even want to type this out, but I feel like I need to publicly shame myself to be held accountable for my book buying. In 2014, I bought 211 books. Yes, you read that correctly. If you'd asked me how many books I bought, I might have guessed 125 or maybe 150 AT MOST. I can't believe I was this out of control! Most of the books I bought were bargain books or discounted at online retailers, but I still spent a lot of money on books. I can't even justify this kind of book buying. 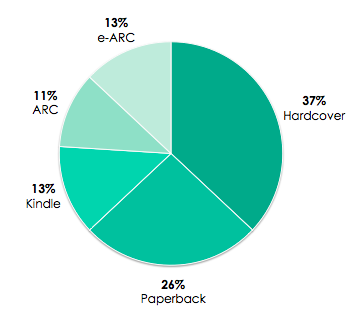 Interestingly, 37% of what I bought this year were books I'd already read (prior to buying). New editions of old favorites, review books I loved, books I originally got from the library... I had no idea that I was adding so many "already read" books to my shelves. If I can cut this down in 2015, I'd already be a long way towards buying fewer books. Something's got to change this year - I can't keep this up! I'm glad that I read 30% of the books I bought this year, but I'm disappointed that I added that same number to my TBR. Do you see why I said I ruined any progress I made on my TBR this year? I was adding books to my shelves at about the same rate that I was taking them off! I'll never get my TBR down if I don't break this cycle. What does this mean for me in 2015? Well, I want to continue to have variety in my reading choices. Whether it's the genre or intended audience, I like being a more eclectic reader! I feel like that's something I succeeded at in 2014, so hopefully I can keep that up this year. I won't worry too much about the publisher or the format, though I'll be curious how those statistics will compare year-to-year. But my biggest takeaway from what I learned about my reading habits in 2014? I hope to make a dent in my TBR, thereby increasing the number of backlist books I read, but I'll never be able to do it if I don't get my book buying under control and learn how to be more selective with review books. How am I going to accomplish those two things? This is such a beautiful post! I love the graphics, and the way that you've explained everything. You are very talented, my friend! Although I don't have the time or the talent to create such amazing spreadsheets, I'm certain that my statistics would turn out pretty much the same as yours! I haven't bought as many books, but I have a tendency to read library books over the ones on my shelves, so this year I'm taking a library hiatus, as well as cutting down on review books, in an effort to read more of what I own. I've also decided that I will only buy a book if it's one that I plan on reading immediately. Last year, I finished Throne of Glass and ran straight out to the bookstore to grab Crown of Midnight, and I realized that I love the feeling of diving into a book right when I come home from the bookstore. My goal for this year is to recreate that feeling when necessary, but to focus on reading what I already own. Good luck to us both -- we can DO THIS! YAY STATS! Hannah, this is so gorgeous! 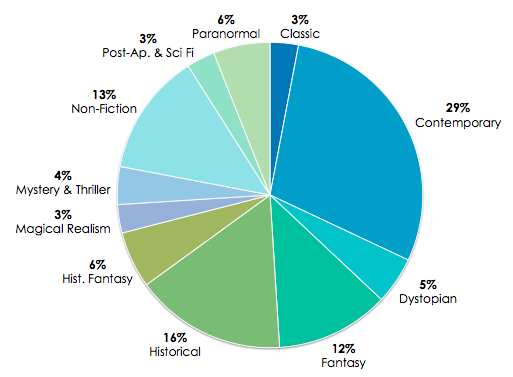 I love seeing the breakdown of books into categories. I wish you luck on getting close to 50% from your TBR list. I know I need to do the same since my TBR continues to grow every time I buy a book and don't read it. :P I'm hoping that I read more general fiction this year because I read a lot of YA and romance books. I've seen some awesome gen fiction ones, so I'm making it my goal to read more. Book Outlet is truly a great but terrible place. Lollll. Eek, this is such a fun post! As we were just chatting about on Twitter, I'm also a stats geek -- and your breakdown was so fun to read. 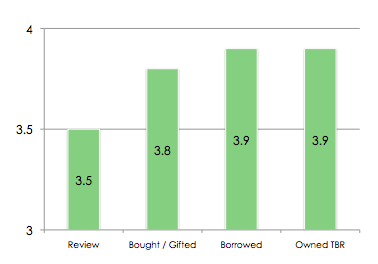 You've also inspired me to add categories for bought versus received for review -- I try to keep those numbers pretty neck-and-neck. For a while I was reading only review books, and that definitely burned me out. Now I try to mix it up with novels I've had languishing on my shelves for a while . . . so fun! Happy reading in 2015! This is such a wonderful post. I have never understood why people buy books that they have already read. Since my sister and I don't have much money to spend on books we look for books that we think we will both like that neither one of us has read. I can't believe that you bought that many books. How do you have the room to store all of them? I bought my first kindle a couple of days ago. It isn't supposed to be here for a while, but I'm sure my ebook reading will increase this year. I love stats and you laid out your stats so well. I should track some of this stuff in 2015. An interesting statistic that I tracked in 2014 is which year the book was published. I found out that I read 21 2014 releases and 18 2013 releases. I had a lot of only one book read from 2000 to 2009, but 2006 had a jump to 4 books published that year. I think this statistic would be interesting in your area also. Loved reading your stats! I wish I was more organized [and good with graphs] so that I could put my own together because it really is interesting seeing how everything breaks down. I'm actually trying to track some of these things for myself these year and I can't wait to see what the final results are. I'm for sure tracking review copies and what I'm buying versus what I'm actually reading. May we both do better! I think it's very important to analyse our own habits, so we can keep up with those we love but correct those we don't. I had much more economic freedom this year so I went on a crazy book buying spree, and now I'm stuck with more books I can read in a year. So, you are not alone in this. Trust me. I actually had some similar resolutions regarding my reading habits this year. My main focus will be my TBR, so I'll do my best not to buy many more books. I'm also done with review copies for the year. Unless they are books I've been highly anticipating of course. All in all I think your decisions are very wise, and that's good, because that means you're on a good track with your resolutions for the year. I'm dying to know how you plan to do it, though. I must be equally nerdy because I loved reading this whole thing. So awesome! I want to pay more attention to my stats now. By the way, where do you make your graphics? I love all the ones you put in your posts! Oh my god this is heaven indeed. GAH! I love posts like this! I did my own statistics post for 2014, but didn't even think about some of the categories you mentioned. Saving this for next year! I love this post and reading it makes me want to write something similar. Except since I don't really track most of this it would take pretty much forever to do. But maybe I can make a point to start tracking stuff better, so I can look at it all at the end of 2015... which of course feels forever away at this point.